The patented Gale Sail from ATN, Inc. is the safest and easiest way to hoist a storm jib in storm conditions. It eliminates the need for a removable headstay. It eliminates the dangerous job of unfurling, dropping and stowing away the furled working sail to free up the roller furler in windy conditions to hoist the conventional jib. 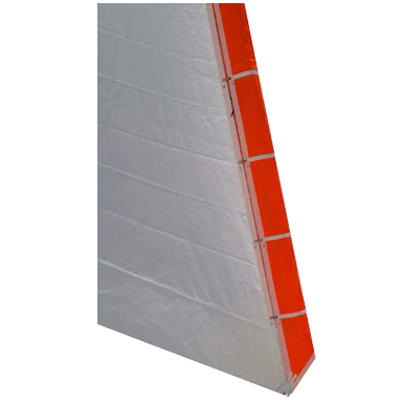 Since it is hoisted over the furled headsail, the Gale Sail prevents any dangerous accidental unfurling. No transformations or alterations of the rig are needed. The Gale Sail is ready to be hoisted immediately. sail, which most of the time has not been designed or built for that purpose. Also, not all roller furlers are built to reef. The Gale Sail slides up and down amazingly well because Dacron slides over itself very well. The next time you walk over a folded sail on deck, take notice of how slippery it is. It can be hoisted with the spinnaker halyard or spare jib halyard. It requires less halyard tension than a conventional storm jib would need since its luff (pouch) is supported by the wide forward part of the roller furled sail. By the same token, chafing is not a problem since the Gale Sail is riding on a large area. Chafing is a problem when a lot of pressure is on a small area, not when it is spread over a large surface. The Gale Sail is not a new, untested product. It has been sold in Europe for over 8 years. It is possible to retrofit a conventional storm jib onto a Gale Sail. The Gale Sail is part of the Cover Sail patent, from Europe's well known inventor Axel Lage.